You haven't truly experienced these classic Altadis USA cigars until you've had them in our exclusive 4 1/2x60 Robolo size. 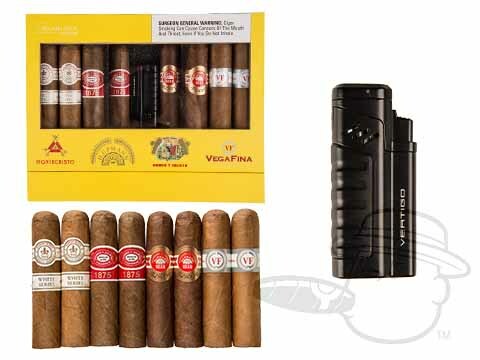 Luckily, this sampler collects them all, along with a Colibri cigar lighter for one convenient low price. Showcasing fan favorites Montecristo White, Romeo y Julieta 1875, VegaFina, & H. Upmann in the short, stout Robolo vitola, our Altadis 8 Cigar Robolo Sampler with lighter delivers the flavor you love in a whole new way. Warning - Once you get a proper taste of these cigars in the Robolo size, you may never want to go back. Altadis 8 Cigar Robolo Sampler With Lighter is rated 2.4 out of 5 based on 1 customer ratings.